GREAT RATES FROM MARCH THRU 2019 PER NIGHT! BEAUTIFUL BEACHES! 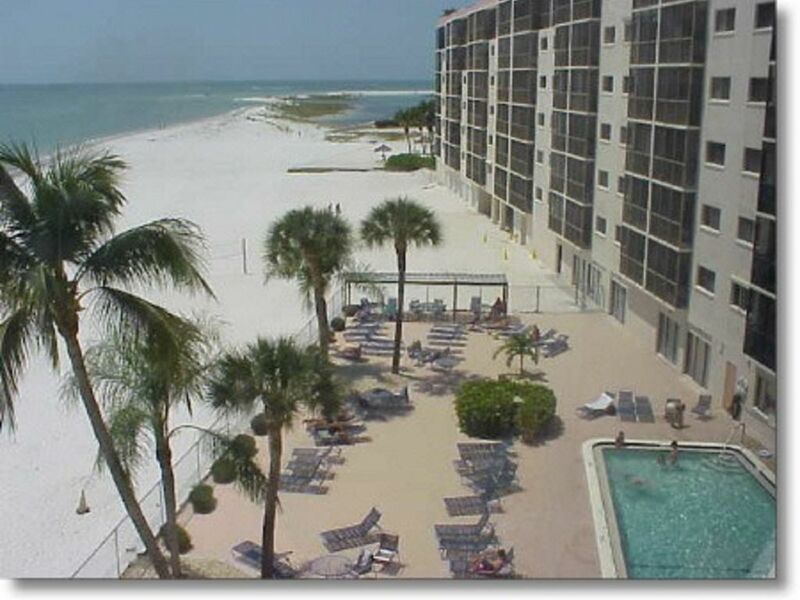 Luxury Beachfront Newly RENOVATED waterfront condo located directly on the beach-Rated #1 on Fort Myers Beach! Relax and lounge on our private WHITE sandy beach while watching the dolphins. Fish or comb the beach for shells. Two Bedrooms, Two Baths and Queen Size Sleeper Can Sleep 6. Master bedroom:New King size bed, color TV, full bathroom and patio. Guest bedroom:New twin beds, private bath with shower. Kitchen:Refrigerator,stove,dishwasher,washer/dryer and all the conveniences of home. Living room: cable television, DVD/VCR, stereo screened lanai.Enter lanai from master bedroom or living room. View the Gulf, and beach. deposit not included in quote. just listening to the waves. You have such a peaceful location. Hello, Marcia! I just wanted to let you know that our stay at your condo was absolutely wonderful! The accommodations were perfect and the location was spectacular! Once again our stay was very impressive and I will keep your number in our vacation records and definitely recommend your condo to friends and family. Hope you and your family had an enjoyable holiday. Happy New Year! Guest Comments : Hi! We had a wonderful time in your beautiful condo, thank you for renting it to us. I am so sorry it has taken me so long to respond to you. I'm having a tough time adjusting to life after vacation! It must be the cold weather that smacked us in the face when we returned from 85 degrees! We had a fabulous time! The condo was exactly as we had expected... perfect! The beach was wonderful to look at, sit on and stroll along. The pool was clean and warm... just perfect for our girls. It really was a 'home away from home' for us. I was able to find everything in the kitchen and appreciated all the amenities... especially the washer and dryer. But I can't overlook the full-size fridge with ice maker, dishwasher and plenty of counter space for me to do all that needed to be done. Guest Comments: We saw dolphins on our first and last days, which was perfect. Someone said they saw manatees no more than 25 feet from the shore on Saturday. (but because we didn't arrive until late Saturday night, we missed seeing them) We found beautiful shells along the beach. We found the bigger ones right outside our door. We truly enjoyed looking at the wonderful shells you had displayed around the condo too. All in all, we would definitely book with you again next year... but we are planning to be cruising in the Caribbean next year. We have shared our vacation memories with many friends and have told all of them about your beautiful condo. Who knows, one of them may be contacting you! Thank you for sharing your wonderful condo with us! LINENS AND TOWELS ARE SUPPLIED. Washer located in the condo. Additional laundryroom located on the lobby floor. Dryer located in the condo. Additional laundryroom located on the lobby floor. Private parking lot for guests. Marinas available nearby for rentals and storage. 1 king, 2 twin, 1 queen sleeper sofa in living room. Heated pool, outside shower, ping pong, volleyball nets. Crib available upon request. Very nice on a wonderful beach. Very comfortable condo. Having beach chairs and towels was very nice. The condo and building were clean and in a convenient location. Unit 412 was a very comfortable and clean condo with beautiful views of the beach and gulf. We especially enjoyed the lanai for watching the beach activity as well as the pretty sunset. The owner was very attentive and everything was orderly with no unpleasant surprises. We enjoyed the nearby beaches, restaurants, and the pool. Regardless of a week of poor weather, we really enjoyed our little getaway. Very clean & tidy. Spectacular view! Location is great. Convenient to many nice restaurants. Thanks! Clean, quiet, beautiful view and a fantastic property!!!! This is an amazing location!!! The view is stunning, the condo is updated, clean and the view and the beach is outstanding. The condo is close to all amenities, including restaurants and shopping. The beach is amazing; clean quiet and right at the doorstep. The owner Marcia is amazing. She is kind, considerate and so helpful. She is awesome to deal with! This location cannot be beat on any level. Ocean front - who could ask for more!!!! Enjoy the dolphins from the bridge nearby and from the balcony - wow! Very nice accommodations! Beautiful beach. Our first stay in this area and we will definetinly be back. The condo was well maintained, and owner was helpful when needed information. I only wished we could have used the beach, and had a heads up about the RED TIDE before booking this property. Would like to go back when we can use the beach!! Hiking, biking, fishing, wildlife viewing, golf, shopping, swimming, snorkeling and diving, water skiing, boating, daytime/dinner/dance cruises, offshore gambling, volleyball, and ping pong. Other Activities: jet-skiing, charter excursions, dinner cruise, flea markets, shopping and excellent dining. we had a great time in your condo, thank you very much. We enjoyed the condo and the activities in the area a lot. Though we booked at last minute, everything worked perfectly. We loved your condo very much. The view from the balcony was marvelous! The furniture and equipment were very comfortable, clean and well looked after. We had everything we needed and felt safely. The pool was lovely and cleaned everyday. The beach was very large and cleaned, only the sea was not so inviting on every day. Some people told us that this were 'red tide', which happens from time to time. Nevertheless we went swimming a few times and my husband had a lot of fun fishing. This was our fifth vacation in Florida. After the stay in your condo we went to the Everglades and visited The Keys and arrived home last weekend. Your condo was the best accommodation we have ever had! I hope we can come back some time and maybe stay a little longer. As it is very, very cold in Germany at the moment (maybe we will get snow very soon), we look forward to a further vacation in Florida. Angela, Hans, Jannick and Niklas.